Victims may have been racing at the time of the crash. Victims may have been racing at the time of the crash. Victims may have been racing at the time of the crash. PHOENIX, AZ — One teen has died and another was injured in an ATV collision in Phoenix Sunday afternoon. 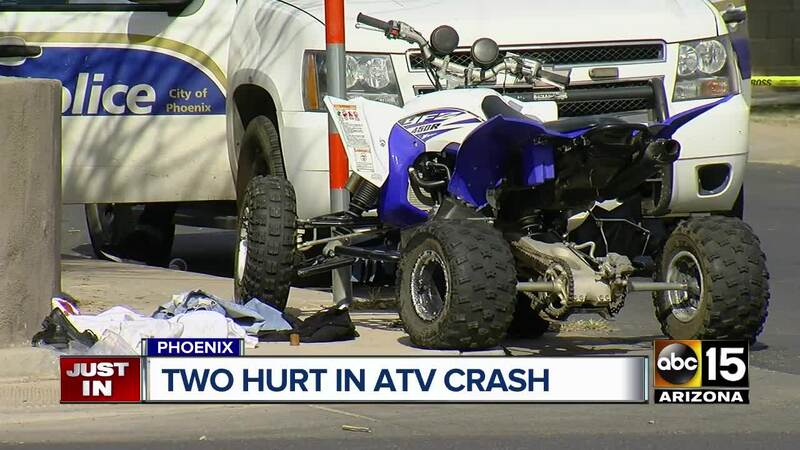 Phoenix police say both ATV riders were driving westbound on Virginia Avenue, possibly racing each other, when one of the ATVs crashed into the other. The force of the impact caused one of the riders to drive off the road and collide with a stop sign on the northwest corner of 65th and Virginia avenues. Authorities say one of the riders, later identified as 19-year-old Sergio Avila, was transported to the hospital with life-threatening injuries. He died from his injuries a few days later. The other rider, an 18-year-old male, was also hospitalized with serious, but non-life threatening injuries. According to Phoenix Police Sergeant Armando Carbajal, the teens weren't wearing helmets when the crash occurred. Officers say impairment does not appear to be a factor. Stay with ABC15 News and abc15.com for updates to this developing story.